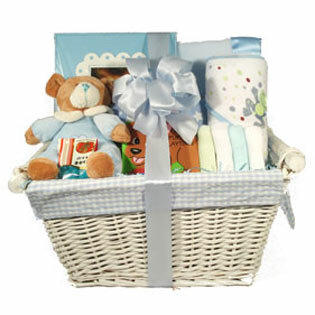 Baby Boy Gift Basket- What a lovely gift for a new baby boy arrival. Mom will be sure to open this up to help stock the nursery. In this cute wicker hamper gift basket we have included all of our soft warm favourite things for baby, like baby's first wash clothes,a blue baby receiving blanket, embroidered blue baby blanket, baby's first bath buddy story book, baby change pad, 8 x 11 natural wood photo frame, jelly belly "It's a boy" jelly beans, diaper vest one piece jumper, stuffed bunny rabbit rattle and a blue 9 inch soft plush, "It's a Boy" teddy bear. This baby gift basket would be such a cute addition to the new baby boy's nursery.